The earliest unions in Tasmania were organised by craft workers. There is evidence of a printers' union being established in 1829, and tailors', carpenters', bootmakers' and bakers' unions in the 1830s. With some notable exceptions, such as the Hobart Mercantile Assistants' Association, 1847–55, union organisation only spread slowly after 1870 and more especially the 1880s, to encompass other groups of workers, such as miners, seamen, wharf labourers and later teachers. At the same time, there is evidence of collective industrial action by non-craft workers well before they formed unions. Typical examples include petitions for a wage increase by government clerks in 1842, and for improved working conditions by Launceston post office clerks two years later. Early craft unions, like the Launceston Printers Benefit Society (1849–54), were more concerned with the provision of friendly benefits (sickness and unemployment relief and a funeral fund) and finding members work than industrial action. There is evidence that colonial authorities used convicts to suppress combinations of free workers in the 1830s and 1840s. Most early unions were short-lived, collapsing within five years of formation, and this pattern only slowly altered in the course of the nineteenth century. Bodies like the Hobart Trades Union (1844–53), with recognised leaders like William Jeffrey, sought to provide broader representation to workers in struggles against unemployment and transportation. Workers also mobilised against the pernicious Master and Servant Acts in the 1850s. The cessation of convict transportation and gold rushes in Victoria in the early 1850s caused labour shortages that assisted renewed organisation among trades like carpenters, stonemasons and printers. From the 1880s onwards workers from more specialised trades like saddlers, as well as labourers (including coal lumpers, wharf labourers), coal and metal miners and other groups like engine drivers, mill-hands, railway employees, hairdressers, shop assistants and carters, began to organise. However, the small size and comparatively sluggish growth of the Tasmanian economy as well as recurrent bouts of unemployment continued to undermine union organisation. While the vast majority of unions in Australia prior to 1900 collapsed within five years of being established, survival/longevity was, if anything, a more significant problem in Tasmania. This may also explain why, despite evidence of collective action as early as the 1840s and 1850s, teachers and public servants were relatively late to formally organise in comparison to their mainland counterparts. One of the earliest instances of formal organisation by women was the attempted establishment of a nurses' association in Launceston in 1891. The establishment of a union peak body, the Hobart Trades and Labour Council in Hobart, helped extend union organisation from the mid-1880s. The Depression of the early 1890s and hostile employers caused many unions to collapse, and recovery was slow. The establishment of government industrial tribunals (wages boards) in 1909 accelerated the renewed growth of unions, especially for the industrially weak such as female factory operatives. As elsewhere in Australia, trades and labour councils devoted considerable energy to promoting workers' interests in the political arena, although unlike most mainland colonies the Hobart Trades and Labour Council was not the direct progenitor of the Labor Party – it collapsed in 1897–98 and did not revive until 1909. A key industrial object was achieving an eight-hour day for all workers. 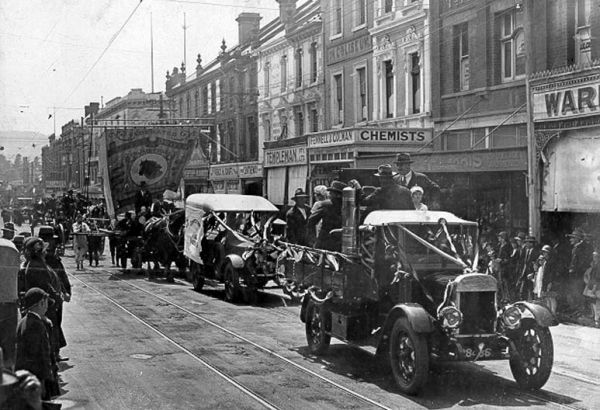 The early closing (of shops) and half-holiday movement was an important rallying point for retail workers throughout the nineteenth century, with organisations formed in Launceston, Hobart and major towns. Although early closing efforts predated the eight-hour day movement, efforts aimed at achieving a voluntary agreement to close early among shopkeepers could never be sustained and ultimately workers turned to the compulsion of legislation to achieve this goal at the beginning of the twentieth century. Prior to 1900 most Tasmanian unions were independent of mainland unions, though links, such as regular correspondence, visits and meetings, were forged in a number of industries. Notable exceptions included the British-based Amalgamated Society of Engineers (later AEU) and Amalgamated Society of Carpenters and Joiners, and the Victorian-based Amalgamated Miners Association. The latter established Tasmanian branches at places like Beaconsfield, Lefroy, Brothers Home (Derby) and Zeehan in the 1880s and White River, Mathinna, Jericho and Gormanston in the following decade. Formal interstate links (amalgamations) and national structures became the norm in the first decades of the twentieth century, though branches in Tasmania, as elsewhere, initially retained considerable autonomy. The Tasmanian trades union movement entered the twentieth century determined to make a better place for Tasmanian working people. Activism on the part of workers was hazardous where employers regarded workers as their subjects, bound to loyalty and liable to black-listing if suspected of being 'treacherous'; where women could be employed for no pay at all for up to twelve months, in the hope of receiving a pittance the next year. Despite the opposition of employers, governments and most of the press, branches of mainland unions began to appear and grow and successful strikes were conducted. During the First World War the trade union movement campaigned against conscription, in the face of opposition so ferocious that the Hobart Trades Hall was physically attacked. The movement remained militant in the 1920s as the state's population fell, resisting efforts to break unions and attempting to gain compensation for industrial diseases and injuries. The Depression created new difficulties and priorities. Union members struggled to feed themselves and their families, fought evictions and defended their right to protest. The unemployed combined, principally in the Unemployed Workers' Movement, against the odds presented by the sheer numbers of those desperate for work of any kind for any pay. Wages rose and unemployment fell during the Second World War, but in the years following the union movement was confronted with the difficulties of absorbing a new immigrant work-force and responding to an intensified propaganda campaign against union militancy. The union movement encompassed an enormous variety of political opinions: communists sat with those who detested and feared them; ALP supporters belonged to all factions and some to none. In addition to combating employers, unionists frequently found themselves required to combat each other. In 1968 the separate Trades Halls of Hobart, Launceston and Devonport were amalgamated as the Tasmanian Trades and Labour Council, under controversial circumstances. There were accusations that the new secretary, Brian Harradine, represented not workers and trades unionism but the National Civic Council and the Democratic Labor Party. As unemployment rose in the later 1970s, dissensions exacerbated by Harradine's leadership saw the creation of a rival Tasmanian Trade Union Council in 1980. Tasmanian unions were re-united in 1984 under the leadership of Paul Lennon. As public sector unionism rose and private sector unionism fell, new campaigns were launched around broader equity issues such as affirmative action and reconciliation. Further reading: M Quinlan, 'Hope amidst hard times', THRAPP 33/1, 1986.